A civil rights activist, lawyer, filmmaker and author, Valarie has been pursuing the path of peace for the past 15 years. 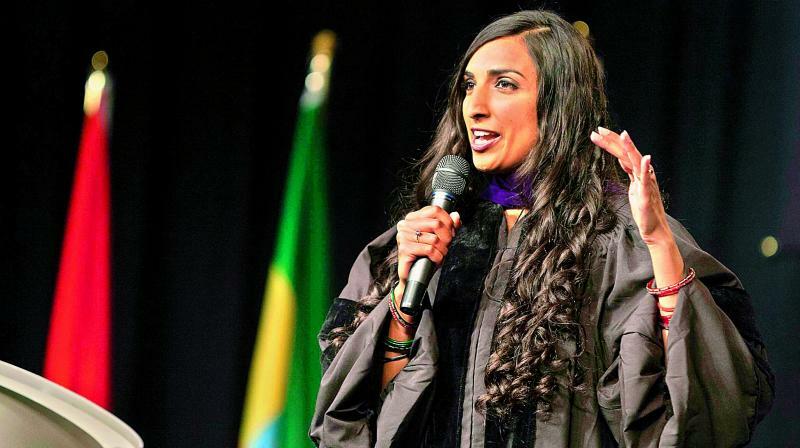 College of Saint Benedict Commencement Address, Class of 2015, Valarie Kaur. On February 22, 2017, Srinivas Kuchibhotla was murdered by a gunman in Kansas who said ‘get out of my country’ before he opened fire. The incident reminded Valarie of the murder of her uncle a few years ago, which was also the reason for her to pursue activism. “I was devastated by the news and flashed back to 15 years ago when Balbir Singh Sodhi became the first person murdered in a hate crime after 9/11. Like Balbir Uncle’s murder, Srinivas’ murder is not an isolated incident. It’s part of a larger climate of fear, hate and vitriol, and foretells more violence to come. The current crisis in hate violence in America is only the latest chapter in an epidemic that began more than 15 years ago in the aftermath of 9/11,” says Valarie. Valarie has admittedly, been at the receiving end of racism too. In December 2015, she was stopped from boarding a flight to LA after a co-passenger suspected her of being a terrorist, because her bag didn’t have a luggage tag. “I explained that I was a nursing mother, but she still didn’t let me board with my bag. I had to pull out the breast pump to show her. Only then was I allowed to take my seat. All the passengers in first class watched and I smiled weakly to show them I wasn’t a terrorist,” she says.